There are a lot of top tourist attractions in Punta Gallinas which tourists would want to visit. Punta Gallina is located on the Northern part of Colombia and South America. It is the most untouched place by far. This place has beyond beautiful beaches, sand dunes, and wonderful culture, not to mention the hospitable indigenous people called the Wayuu. Of all Colombia places, Punta Gallinas has the driest climate and its rainy season only falls off between the months of September to December. Tourists will surely enjoy the wonderful sceneries in this exotic destination in most months. One of the top tourist attractions in Punta Gallina is the Playa Taroa which is an amazing beach. Tourists will really enjoy the aqua-colored water without the distraction off too much rock and weeds on water grounds. The wave is enough to body surf and put you to your needed relaxation. Since the beach is only surrounded with sand dunes, you will clearly see the sky as you take a dip on the waters. This is truly a beautiful feel to all tourists who wanted to find some peace and quiet. Since this beach is set in the middle of the sand dunes, people will actually see the most beautiful sunset they have not seen by far. La Guajira is also one of the top tourist attractions in Punta Gallinas wherein you will mostly see untouched mounds of sands which surrounds the beach. The sand dunes are huge and it goes steeply down the beach. It is a nice place to sit and relax if you do not want to get wet by the waters. You can lie over the sand and reconnect with nature as you look above the almost near sky. If you happen to stay in the evening, you will surely enjoy a cold night in the desert. There are not only wonderful tourist attractions in Punta Gallinas but also wonderful indigenous people who draw the hearts of tourists. These people called Wayuu are hospitable and creative. Along the deserts and beaches, you will see them selling their hand-made bracelets and crafts made of pebbles. You can see these tribe wearing long dresses to protect them from the heat of the sun and the blow of the sand. Tourists who would want to learn about these people can arrange to have a stay with the families to find out how they live, such as the fact that they get water from springs and freshwaters available since there is no access to electricity and water yet in the area, and the fact that they catch fish in the ocean to eat. Aside from the possible encounter with the Wayuu, people can also get in touch with the living creatures in the area. You will see goats, scorpions, snakes and lizards. 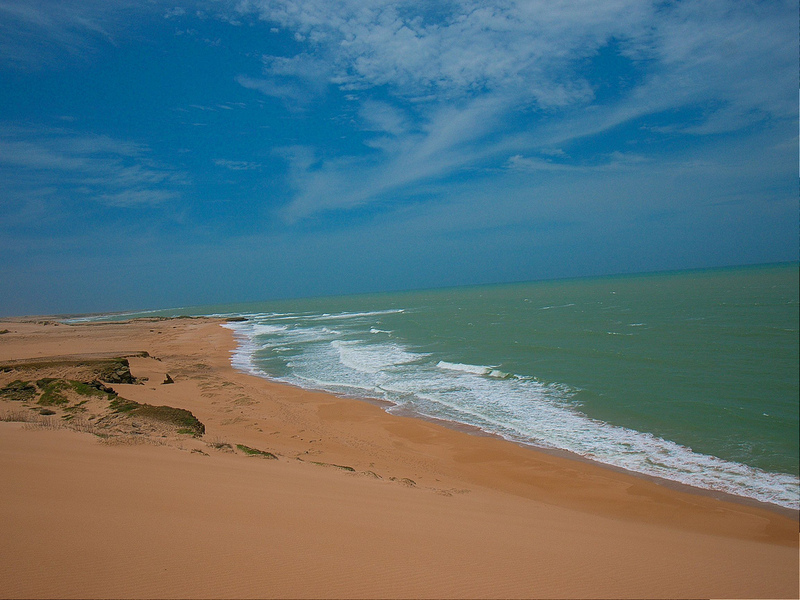 Punta Gallinas is a place for tourists who want to experience serenity in their vacation. Punta Gallinas will give you a feel of losing back in time wherein you go back living in a simpler era. This will lift you in isolation as you reconnect with nature and enjoy quality time with family, friends and loved ones and meet new wonderful people. Punta Gallina is indeed a destination to people who wanted to find total rest and relaxation.